Its onboard X/Y stereo condenser mics are arranged with the right and left mics on the same axis. This design ensures that the mics are always an equal distance from the sound source for perfect localization without phase shifting. Frequency response remains uniform throughout your recording. The result is great stereo recording with natural depth and accurate imaging every time. Custom designed, onboard X/Y stereo condenser mics allow variable recording patterns at either 90° or 120°. Our unique design lets you rotate each mic capsule from 90° (standard) to 120° (wide-angle) stereo for the ultimate versatility in any recording situation. Now your recordings can be richer than ever before. Choose up to 24-bit/96-kHz linear PCM WAV files for audio resolution that surpasses CD quality. Or, when maximum recording time with smaller file size is desired, select a variety of MP3 formats to produce smaller files suitable for web or e-mail distribution. The H4n uses compact SD or high-capacity SDHC memory cards of up to 32GB. Unlike other media such as tape or discs, SD cards produce no mechanical noise, are not disturbed by vibrations and are readily available for your convenience. Our new, digitally controlled, high-quality preamplifier renders audio so precise, you'll sound like you recorded in a world-class studio. And this new preamp means you can make recording level adjustments on the fly. Of course, an automatic level setting function is also built in to optimize the level quickly as the situation requires. Learning new songs is now a breeze with the H4n's adjustable playback speed that ranges from 50 to 150 percent, while keeping pitch the same. This is also a great feature for learning a language, conference recording, and various electronic news gathering (ENG) situations. With its low-cut filter, the H4n effectively reduces unwanted background noise like wind or air-conditioning noise. A variety of compressors and limiters help to optimize the dynamic range while preventing distortion. For situations where you require maximized, continuous recording operation you can select stamina mode which effectively doubles battery life, letting you record continuously for about 11 hours in 16-bit/44.1-kHz linear PCM format. 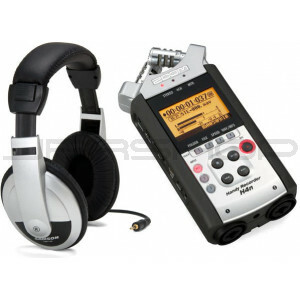 The H4n is the only handheld recorder that features built-in combination XLR/Phone connectors with phantom voltage source capability. With its Hi-Z inputs, you can record guitars or other line output sources such as mixing consoles. A separate external mic input supports plug-in power microphones. Proper miking is essential to making a great recording. The H4n is the only handheld recorder that allows recording on four channels simultaneously by using your own external mics with its onboard mics. Use its built-in mixer to blend the channels for perfectly balanced recordings of extraordinary depth and clarity. You can set your H4n to automatically record whenever sound above your designated level is detected. This ensures that you capture everything of importance while minimizing blank sections such as when recording a conference or lecture. The H4n can also be set to continuously record the most recent two seconds of audio in memory. Now, you never miss the beginning of anything you want to record, even when it begins suddenly. The MTR mode allows simultaneous 2-track recording and 4-track playback. With this feature, creating songs by overdubbing vocals and instruments is a snap. Level and panning can be adjusted individually for each track on the built-in mixer, and you can even do a mixdown right on the H4n. The H4n has a number of useful tools that will be welcomed by musicians. The built-in tuner allows for quickly checking the pitch of a vocalist or tuning an instrument. The selectable metronome sound can serve as a guide rhythm during recording and is also great for practicing. Face the Music Head On.